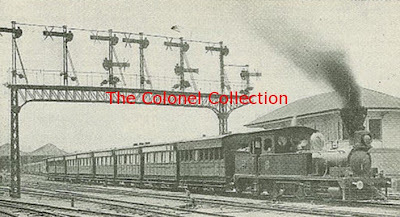 A lovely old shot from 'The Colonel Collection' showing a train at, what was, a lovely Tutuban. The signal gantry has long gone, with only one lonely semaphore survivor believed to still exist at Caloocan. The loco, carriages and even the signalbox have also gone to god. Quite possibly though, they may still be the original rails and sleepers. Sadly these are days long gone, days of a very proud rail system. Thanks to everyone who contributes to our society so we can share with others. It is sad to know that I will never get a chance to see this. The old Tutuban is gone and much of the history in that place is also gone.